You won’t find any books of poetry on our shelves, but between our stock of wines and our freshly-baked bread we can get you at least halfway to Omar’s Paradise! 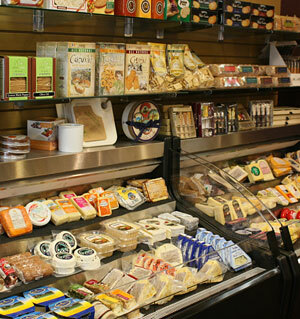 And there are plenty of other delectable items in our food department besides bread, including cheeses, chocolates, cured meats, patés, frozen hors d’oeuvres, salsas, soups, sauces and so on. Looking for food or wine accessories? Come see us for corkscrews, cheese knives, serving trays, picnic packs, wine racks, Riedel stemware and an array of gift and entertaining items. Open Monday through Friday 10 a.m. ’til 7 p.m., Saturday 10 a.m. ’til 6 p.m., Sunday noon ’til 5 p.m.
Open Monday through Saturday 10 a.m. ’til 8 p.m., Sunday noon ’til 5 p.m.